An opportunity to acquire one of the last hand built and rare, top of the line Mercedes-Benz V8 Coupe. 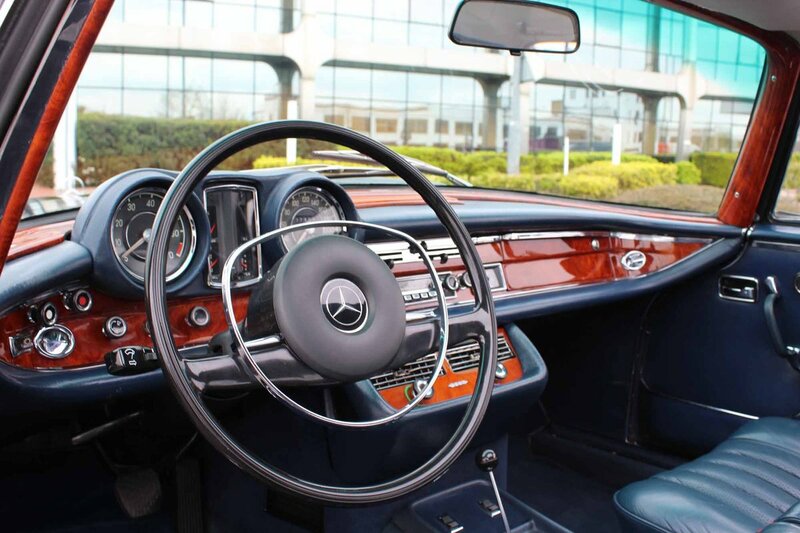 ‘If you feel obligated to ask about the price you not only will never understand the car, you have branded yourself incapable of ever appreciating its virtues even if someone gave you one.’ – Car & Driver on the Mercedes-Benz 280SE 3.5. 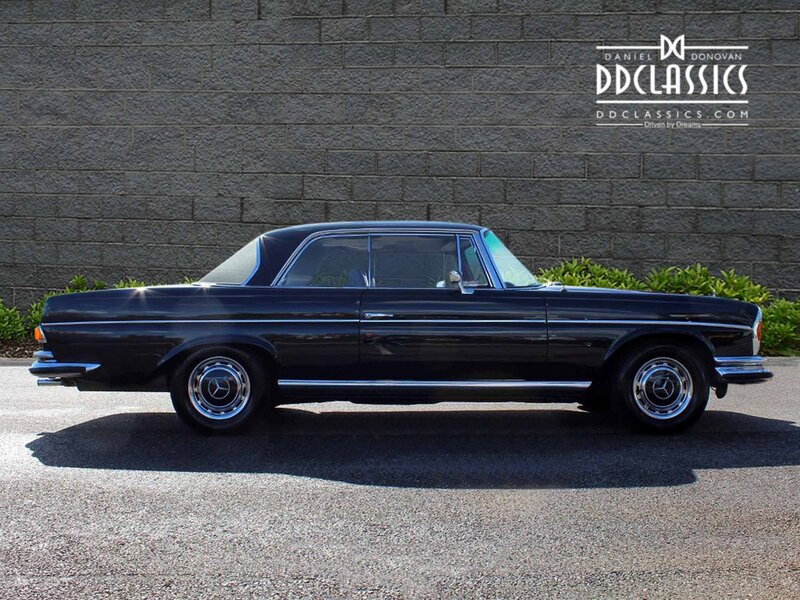 Introduced in late 1969 as a prestige model to supplant the somewhat underpowered six-cylinder 280SE, the V8-powered, W111-Series 280SE 3.5 in both coupe and convertible form was of immediate appeal to wealthy customers who were accustomed to having the best quality and workmanship available in an automobile, but didn’t need or desire the next step up, the over-the-top 600. The hand-built body of the new model was slightly restyled, with a cleaner and flatter nose and radiator shell, but was still quite conservative. Beneath the wide hood there now rested a Bosch fuel-injected, 200bhp overhead-cam V8 with 211 foot-pounds of torque designed to deliver excellent performance. One reviewer referred to it as having a “hot-rod”- like persona with a lovely exhaust snarl – while meeting ever-more strict emissions laws in the US, the company’s most vital market. The compact but sturdy engine was capable of moving this big 4/5-seater to 100 kilometres per hour in under 10 seconds and offered a top speed in excess of 200km/h, a substantial improvement on the six-cylinder version’s figures. Large vacuum-assisted disc brakes at each corner allowed the driver to slow with ease, and handling was described as very comfortable, thanks to its coil-sprung independent suspension. The craftsmen at Sindelfingen produced just 3,270 of these 3.5 V8 Coupe worldwide with 818 cars alone built for the USA market leaving the balance of 2452 cars divided to rest of the world, making them extremely rare. Both the open and closed versions of the 3.5 were fitted with just about every luxury amenity a buyer could ask for. The few choices remaining pertained to paint and interior trim colours and which model of Becker stereo system was desired. It all added up to an impressively costly automobile. 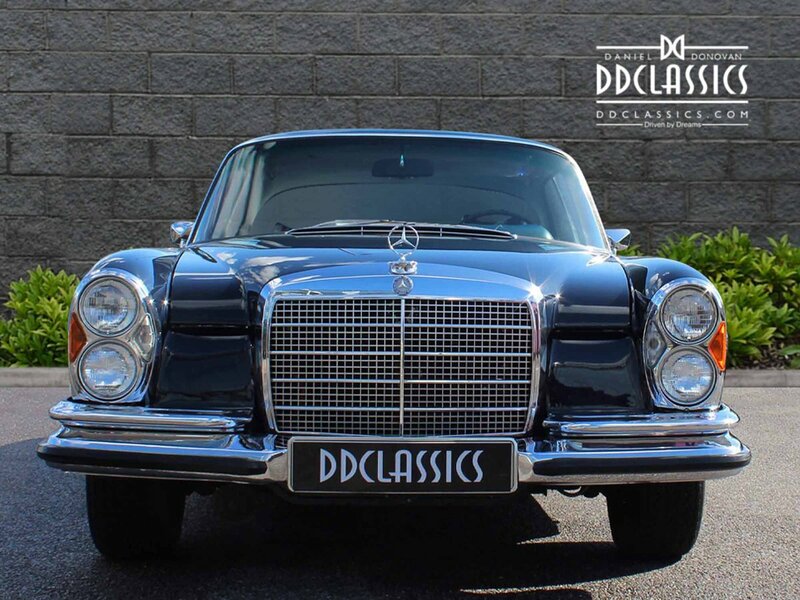 Significantly, the 280SE 3.5 was to be the final model to feature this long-established and much admired body style, and today these last-of-the-line classics are highly sought after by discerning Mercedes-Benz collectors. Finished in Dark Blue 904 with Blue hide and matching carpets. Chassis number #11102412001216 was delivered new to a French Doctor on 25th May 1970. 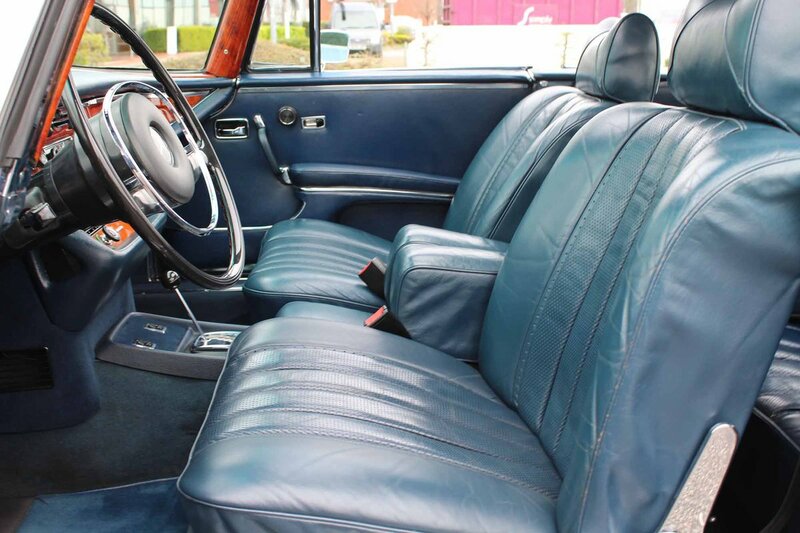 With factory fitted floor change gearbox, Behr air conditioning, Blaupunkt Radio with Hirschmaelectricalcal aerial ( in perfect working order ) electric sunshine roof, 300SE chrome side mouldings, front armrests and head restraints this car was really the top of the line. Over the course of the next 49 years, it has only ever been in the hands of 3 owners. Staying with the first owner and then passing into the ownership of his son in law, by 2008 it was acquired by the last owner where it formed part of possibly 1 of the finest car collection of cars in Europe. Over the course of the next 9 years, the car has travelled just under 7400 kilometres in the ownership and being maintained regardless of expense by marque specialists John Haynes. In total the 3.5 has cover just over 137,000 warranted kilometres from new equating to just 2800 kms per year. 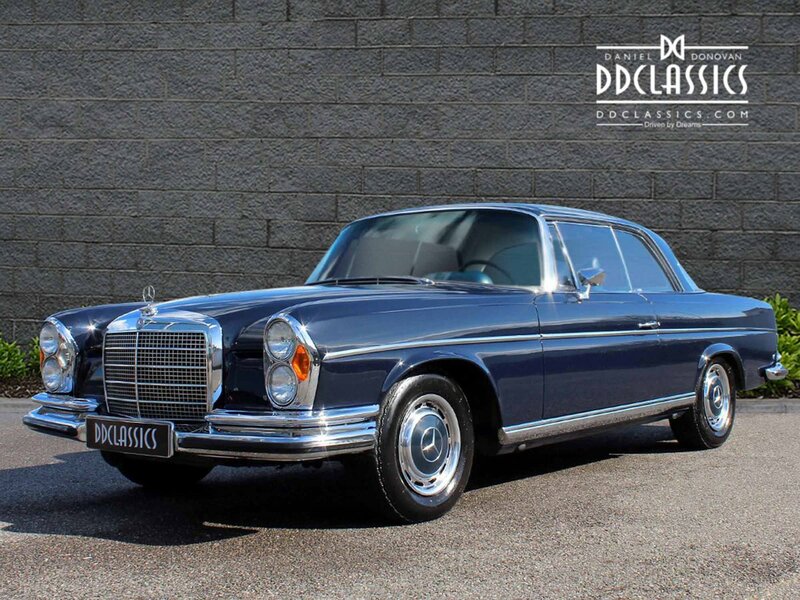 Almost indistinguishable from the 280SE, because of the new 3.5-litre V8 engine it is in a completely different class. This is a wonderful opportunity to acquire one of the elegant styled pillarless coupes with impeccable provenance to match. 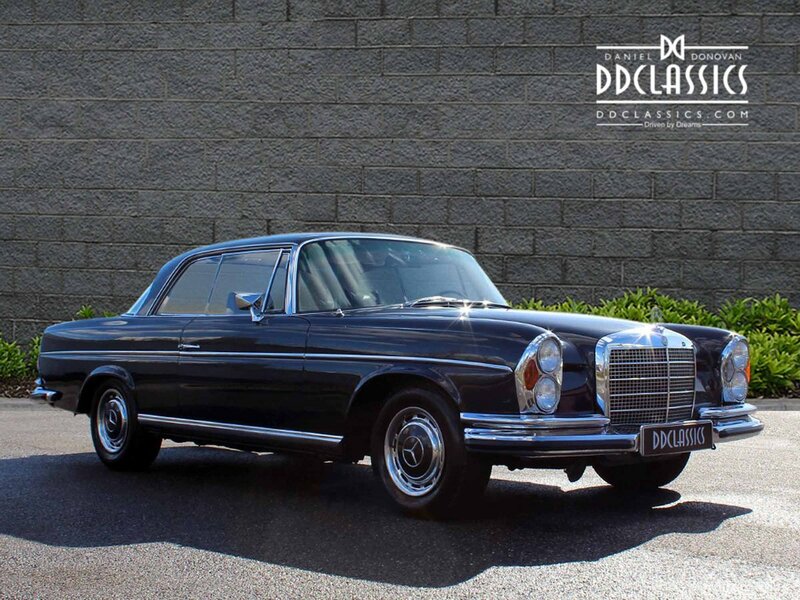 Ready for immediate viewing at DD Classics Dealership in London, please call 0208 878 3355 for more information. Electric sunroof, Blaupunkt Berlin ACR m remote control arm, 4speed-manual, Stainless exhaust, Aluminum Rims MB. Absolutely perfect interior.Completely free from corrosion and runs like a dream with 164.000Km Guaranteed! Very few owners and all documentation.